Did you ever wonder how to make cheese? If you have ever wondered how to make feta cheese you will be amazed at how easy it is for almost anyone to make feta at home. 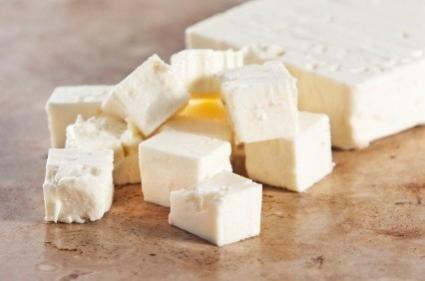 Feta cheese is a Greek cheese that it traditionally made with sheep's milk. It has a sharp, piquant flavor and a crumbly texture that goes well in salads and other dishes. The dry, crumbly texture is achieved by soaking the cheese curds in a salt brine for at least a week. You can make your own feta with either goat's milk or cow's milk. It is very important that you make sure that all of your equipment is clean and sterilized. Do this by submerging the pot, utensils, and storage containers in boiling water for three minutes. Follow the instructions, amounts, and weights exactly. It is imperative to your cheesemaking success. Always keep feta cheese refrigerated once it has been finished. This recipe yields approximately one pound of feta cheese. Pour the milk into the pot and heat it on low until it reaches 88F, stirring constantly. Mix the yogurt into the warm milk. Be sure it is thoroughly incorporated. Turn off the heat and cover the pot. Allow to stand at room temperature for one hour. Dissolve the rennet in a half cup of cool water. Stir it until it dissolves. Pour the dissolved rennet into the milk and allow to stand at room temperature for approximately eight to ten hours. Check the milk. The curd should have separated from the thin, greenish whey. If not, allow to stand an hour or so more. Cut gently but firmly straight through the curds with a long knife, creating ½ inch cubes. Stir the pot gently to loosen up the curds. Allow the curds to firm up by letting them stand at room temperature for ten minutes. Place a colander lined with cheesecloth over a large bowl. Gently pour the curds into the colander. Be careful not to break up the curds. Allow all of the whey to drain off; a process that could take several hours. Mix the drained curds with 1/2 teaspoon salt. Press the salted curds into a mold and allow to stand at room temperature over night. Add five tablespoons salt to 20 ounces of the reserved whey. Stir well, dissolving the salt. Cut the feta into cubes and add to a sterile jar. Pour the brine over it, covering the cheese curds completely. Cover the jar and place it in the refrigerator. Leave it for one to four weeks. The longer it is left to brine the more crumbly the texture will be. Knowing how to make feta cheese means that you can have your own, homemade, fresh feta whenever you like. You will know exactly what goes in it and can brine it to your own tastes. When your feta is finished you can easily use it in any dish you would use commercial feta in, but the results will be much more flavorful. Try making a feta salad dressing or sprinkling it on a Greek salad. Once you have gotten the hang of making feta you might want to try some other homemade cheese. Homemade feta makes a great hostess gift, too. Just keep the feta refrigerated until you are ready to give it to the recipient. Place it in a mason jar with a screw-on lid and tie some raffia around the lid. You may even want to make a homemade label on the computer. Cheesemaking is a great hobby, and many people achieve personal satisfaction from making their own cheese.